A post-asymptotic giant branch (post-AGB) star known as HD 179821 turns out to be significantly less massive than previously thought, according to a new study. Using new data from ESA's Gaia satellite, astronomers found that HD 179821 is not a supergiant, which was suggested by previous observations, but is rather a solar-mass star. The finding is presented in a paper published January 28 on arXiv.org. Discovered about a century ago, HD 179821 (also designated IRAS 19114+0002) is a star in the constellation of Aquila, surrounded by a detached dust shell. 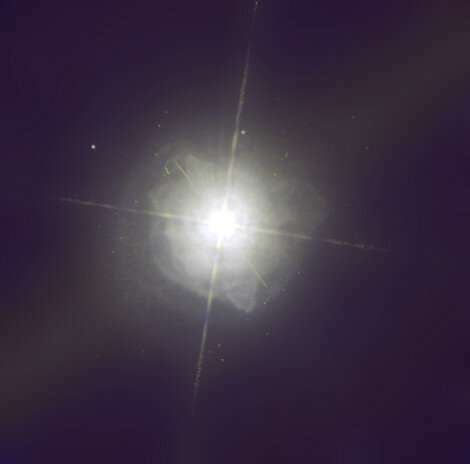 The star is currently classified as a post-AGB supergiant of spectral type G5 Ia. However, although several spectroscopic observations of HD 179821 have been conducted, the exact distance to this star remains a subject of debate. Some studies suggest that it is located about 19,500 light years from the Earth, while others cite a much closer distance of some 12,700 light years. Discrepancy in the distance estimates leaves uncertainties regarding the star's mass and evolutionary status. Gaia's second data release, known as Data Release 2 (DR2), has the potential to resolve such uncertainties as it offers high-precision positions, parallaxes and proper motions for more than 1.3 billion sources in the sky. A team of astronomers led by Mudumba Parthasarathy of the Indian Institute of Astrophysics in Bangalore used DR2 data to obtain the parallax of HD 179821, which allowed them to make new distance calculations. The parallax of HD 179821 was found to be approximately 0.31 mas. Employing an inference procedure developed by other researchers in 2018, Parthasarathy's team calculated that this value corresponds to a distance of about 9,600 light years. Gaia parallax also allowed them to find that the star is located some 850 light years below the Galactic plane. Furthermore, the derived distance and other parameters provided by previous studies, such as spectral type and observed V magnitude, were essential to find the absolute magnitude and bolometric luminosity of HD 179821. These values were estimated to be –5.7 and 4.3 respectively. According to the paper, the derived properties exclude the possibility that HD 179821 is a supergiant star with a mass between 19 and 30 solar masses, which was suggested by observations conducted in recent years. "The derived MV = -5.7 clearly establishes that HD 179821 is not a 30 or 19 Msun post-red supergiant. (…) The bolometric magnitude clearly excludes the possibility, defended by many authors, that it is a very massive (30 to 19 Msun) post-red supergiant star," the astronomers underlined. They concluded that HD 179821 is a post-AGB star of mass in the range of about 0.8 solar masses, an effective temperature of 5,660 K, and a radial velocity of approximately 81.8 km/s. When it comes to the evolutionary status of HD 179821, the astronomers noted that it resulted from an intermediate mass AGB star or from a star that is at the lower limit of a super-AGB star. Its progenitor most likely had an initial main sequence mass of about four solar masses. Well, Thank You Bangalore Astrophysics; perhaps a theory that proposes our sun Sol, is a former red giant now on the tract of 97% of all stars to become a white dwarf via Helium Flashovers, may not be so outlandish after all. @KS: Please consult a dictionary. Your 'sun is a former red giant' notion is but a poor hypothesis, readily falsifiable by studying where the solar system 'ice line' falls, the SNU count etc etc.